(Sorry for all the alliteration in that greeting) Today I thought we could talk about our trusted stats on a stick…wands. If you forgot what I’m talking about then open up your character screen and look in the raged weapon slot. See that icon? Well chances are it’s probably a wand. Remember those? If you are still under level 30 then you may still use it from time to time especially to help spare mana if you’re having difficulty regenerating it. Just let your blueberry tank and you can “go to town” wanding them down (hey that rhymes!). But for us much older more experienced warlocks once we passed the level 30 threshold and began to grow in power we stopped using them because in all honesty, they aren’t really needed. So now, I view them with nostalgia like an old toy from childhood looking back remembering all the fun, wonder and excitement at first playing with them then moving on to something else when I outgrew them. While they do provide the much-needed stats to boost the brilliance of our intellect and speed along our haste for casting spells so we can achieve more DoT-Ticking yumminess, I still often ponder if the design wizards at Blizzard should give them more importance? Omg, I love the addon "Mogit". Now if only I could go back to loving my wand. Er...wait that sounds wrong. Well you know what I mean! I remember my first wand (back in the day) when I was first a feverish student of Fel-energy and very low in level. It was small and looked like a simple twig but shiny sparks of colors and damage flew at my targets when I waved it at them. It was fun to some degree except for it having an autoshoot mechanic that didn’t give me some kind of control like our Fel-flame spell. Despite that problem it was still my own roman candle firework that tinged and singed my targets until my DoTs melted them away. If you have ever used a magnifying glass on ants under a summertime sunlight then you know what kind of evil glee that can bring. My wand gave me that same feeling and so I tried every wand I could find. One wand shot purple sparks, one shot green gobs, one even looked like I was tossing snowballs around. My wands even made different sounds when they fired. Some made “Zwooosh!” noises, some made “Schwaaah!” and the really fun sounding one made the sizzling “Schwooomp!”. Naturally through the course of progression, my ‘lock grew in stature and in levels and so did my wands to some degree but, something was different. I grew powerful, but they didn’t. Perhaps it was they, the wands, who had changed by standing still. Is it just me in my odd way of thinking that thinks this way? While yes, wand stats grew in keeping up with other stat sticks in-game helping to achieve a class balance, but sadly our usage and reliance on them did not. It didn’t matter how cool they looked or what wonderful array of effects they shot forth, wands are still just stats on a stick with all the hitting power of nada. I’ve seen some warlocks hiss and moan while spewing vinegar about how they HATE wands (and I’m being kind in their wording). They would prefer that the wonderous weapons of choice for ‘locks be a sword or dagger along with their OH combo. Some of our bretheren even feel it’s degrading to use wands because they see it as pretending to be a mage or being too “Harry Potter-ish”. Let’s be honest, I think their real frustration comes from the current lame game mechanic of AUTOSHOOT and the lack of any real meaningful control or power behind their wands. To those players I’d like for them to consider the sword or dagger they hold as well. Yes, I like my swords and daggers for my warlock and in truth, I prefer to have a dagger (for my own preference in looks) if given the choice between the two. But in all honesty when was the last time you seen a warlock running into the fray to smack people with their sword or dagger? If we’re suppose to be all-powerful casters of disaster then why do we even need a melee weapon? If we’re suppose to be force in ranged dps doesn’t a wand make more sense? I know I feel that if I wanted an up close and personal melee class I would have rolled a rouge to begin with and not a warlock. As you have probably read the Demo tree should be interesting to see come to fruition in MoP because it looks like it might be going the way of a melee / caster class. A caster in melee range wearing toilet paper? Will people like this or not? Right now with so much speculation and more talent changes yet again who really knows? MoP isn’t even close to an announce date so there is a lot of time for more changes and tweaks. Bottom line when it comes to weapons and any changes…we just don’t know. However, didn’t we all roll a warlock because we wanted a cool and powerful ranged caster, right? Doesn’t a wand make sense as a good weapon epsecially for a range caster? 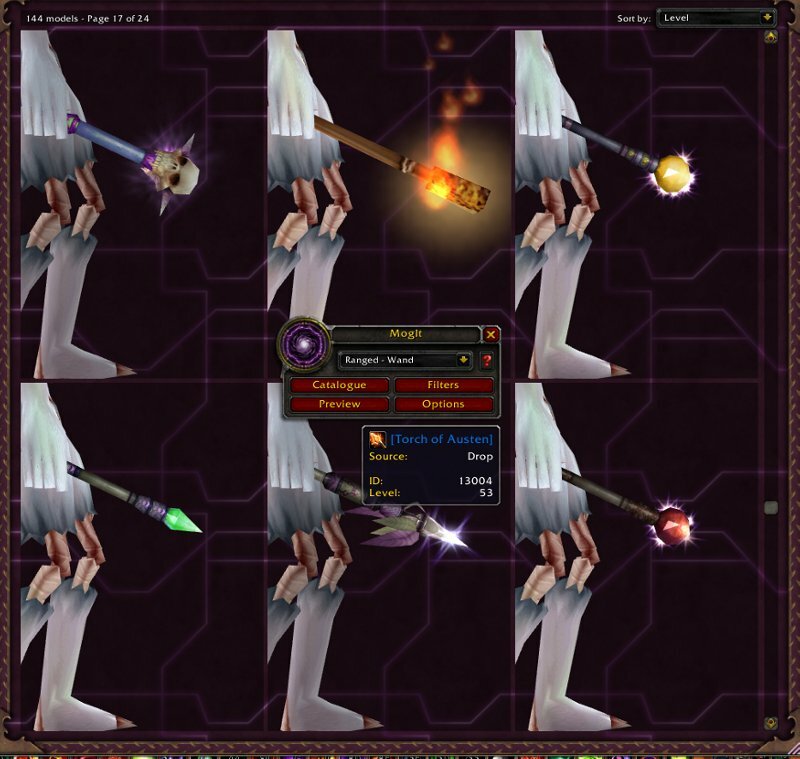 It would be nice if blizzard gave us wands with more power and importance. I want the schwooomp sound with all the flashes of color and damage it will bring. Give me a great wand with some good mechanics and I’ll wave that thing everywhere I go. I feel it’s a caster’s defining weapon and it should be important and worthwhile to have one. Think about other classes. Their weapons make them stand out for their niche. What’s a good prot warrior without a good sword and board? What’s a good hunter without his ranged weapon whether it be a bow, crossbow or gun? What makes their weapons stand out for those classes is because of their importance to that class. It enhances what they are good at doing and defines them. Shouldn’t wands do that for us? I see in guildchat and tradechat folks always giving “Ooh’s” and “Aah’s” towards grand fashioned weapons like Frostmourne or Thunderfury where the weapon and it’s power say a lot. How many players ever show respect to a rare or fancy wand? There are lots of changes coming on the horizon with MoP and maybe if Demonology turns out to be a actual melee-caster style of play then possibly the better choice weapon for them should be a sword or dagger. Maybe I’m just pondering again? As it stands right now all a weapons in our warlock’y aresenal are really worthless. Other than killing critters or very low level mobs in a one-shot would someone please tell me what our weapons do other than other than look pretty and provide more stats? It doesn’t have to be this way. Blizz could put some wand mechanics in place to give the respect factor back to wielding a wand. What if wands were tied into a Soulburn mechanic where it gets a supercharge or overcharge of some kind? Heck you could throw in a particular proc from a spell where for the next 10, 20 or 30 seconds you would do extra damage or give a damage increase if you used your wand. While we’re discussing ideas, what if you could even throw a utility at it like a wand that stuns, silences or whatever other fun you can think to add. Anything would be better than the current state of wanding affairs. Take a Q-tip and throw it at a pally or a rogue or a hunter. Now ask them, “Did that hurt?” Granted, a Mage could easily take sustained damage from a good wanding but I digress on my razing of them. Wands just aren’t powerful or useful anymore and it’s a simple fact. My only hope is that in the future they may regain their power by catching back up. Who knows? With the focus being on the Ally vs. Horde conflict and the destruction of Jaina’s much-loved kingdom, maybe we will have a chance for…dare I say it…an epic wand? Maybe. We can hope so. Even if I never unsheathed my wand or used it, it is still nice to have if even for nostalgia or Transmogging sake. Who knows, maybe next time time we can discuss what to do with our staffs since most ‘locks would rather have the MH+OH combo. Should we just vendor, hang it over our shoulder or run into melee swinging it at things? What do you think? Love me or hate me… thanks for reading.